Proceeds go to the Tibetan Children’s Village, India. 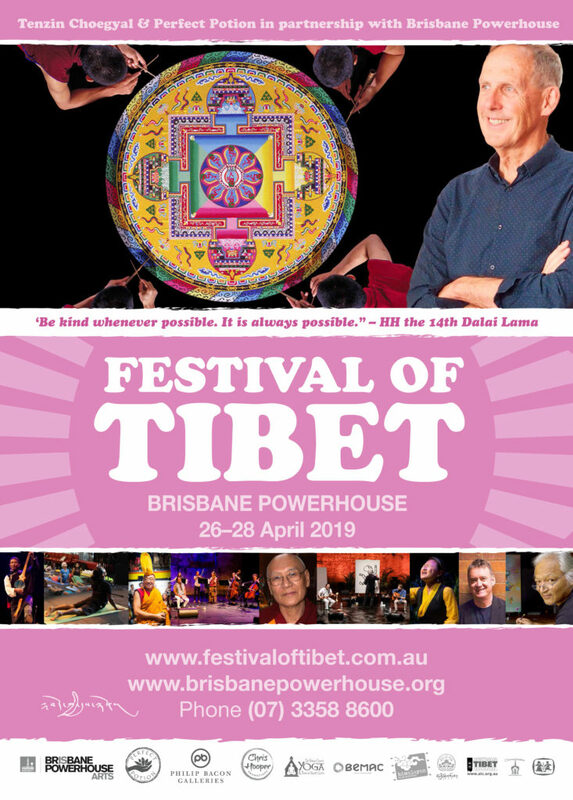 Brisbane’s 11th annual Festival of Tibet will be an event to remember, with something for everyone – discussion, art, music, intrigue and philosophy. Kicking off on the evening of Friday April 26th, MYSTICAL TIBET brings together former Australian Greens leader and environmental activist Bob Brown in conversation with radio presenter, writer and journalist, Paul Barclay for a discussion about conservation, activism and resilience. The evening concludes with the Mystical Tibet concert featuring the superb Camerata, Queensland’s award-winning chamber orchestra in collaboration with renowned Tibetan musician, Tenzin Choegyal. Guaranteed to be an evening of inspiration and heartwarming enjoyment. On Saturday April 27th, in what has become a Festival of Tibet tradition, 1000 STORIES will present a blend of exquisite artwork by Karma Phuntsok accompanied by the joyful, global sounds of fusion band Tibet2Timbuk2 and friends. With their music as inspiration, Karma will create a unique artwork in real time, while sharing personal stories and snippets of philosophy. This concert will also feature the debut of Tibet2Timbuk2’s long-awaited new album. Over three days the Festival will also offer workshops, exhibitions, momo making, chakra healing, public talks, traditional Tibetan art, prayer flag painting for children and the creation of a superb sand mandala consisting of millions of grains of coloured sand. In a program of varied, engaging experiences, both free events and ticketed during the period of the Festival. 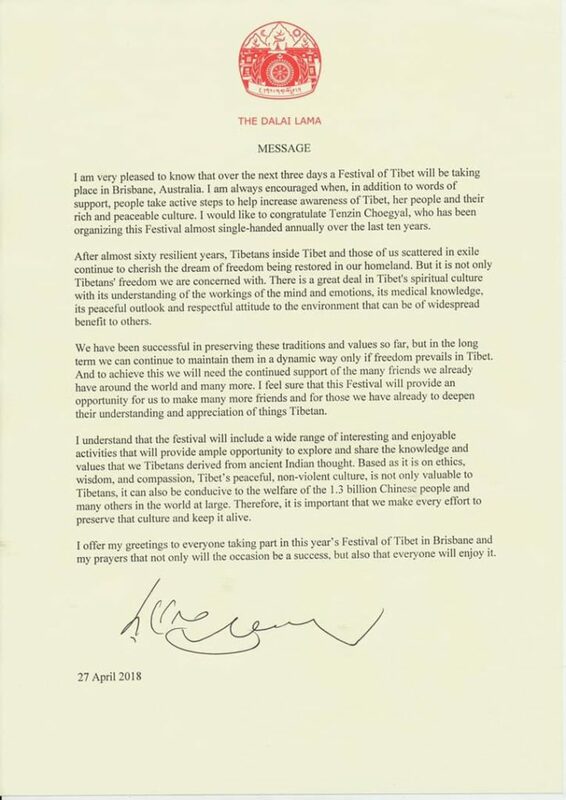 The 11th Festival of Tibet will once again raise much needed funds for Tibetans living in exile, with all proceeds going to the Tibetan Children’s Village schools in India. We look forward to welcoming you at the Brisbane Powerhouse! Proudly sponsored by Brisbane Powerhouse,Perfect Potion, Philip Bacon Galleries, The Yellow Church Yoga & Natural Health Centre and supported by Tibet Information Office, Chenrezig Institute, Chris Hooper Promotions, Himalayan Film Festival, Australia Tibet Council, Woodford Folk Festival, Good Fortune Trust, BEMAC, Tashi Delek Foundation. organizing this Festival almost single-handed annually over the last ten years. term we can continue to maintain them in a dynamic way only if freedom prevails in Tibet. their understanding and appreciation of things Tibetan. preserve that culture and keep it alive. my prayers that not only will the occasion be a success, but also that everyone will enjoy it. Sand Mandala དཀྱིལ་འཁོར། is a Tibetan Buddhist Sacred Art involving the creation and dissolving of mandalas created from coloured sand. A sand mandala is ritualistically dismantled once it has been completed and its accompanying ceremonies and viewing are finished to symbolize the philosophy of the transitory nature of material life. In short the impermanence nature of all things. Who are coming to 11th Festival of Tibet? FOT2019 starts on 26th April with opening speech by Kuno Lhakpa Tshoko la, followed by Mystical Tibet - in conversation with Dr. Bob Brown and ABC’s Big Idea Mr. Paul Barclay and music by Camerata and3 Tenzin’s.